Humanity Mountains is dedicated to improving the education of children in need in Nepal. It aims to help those who assist in taking care of poor, vulnerable or orphaned children, be it their own parents or relatives, or the institutions and orphanages where they are placed. We work closely with other organisations on projects which are child-friendly and aim to empower children and families to create a brighter future for themselves. We are commited to an orphanage in Pokhara as well as to disadvantaged children in the surrounding mountain villages. In order to achieve this goal we count on sponsors and donors as well as fund raising events from our friends. We also sell our products which are mainly art paintings. By doing this we are also supporting a group of local artists. 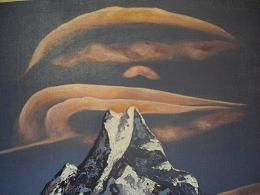 As these oil or acrylic paintings are mostly on a mountain based theme, we are taking these mountains of Nepal to you and hope you bring mountains of help to these children of Nepal. Namastê!